Below are three long-term charts, from Doug Short’s blog post of February 28, 2014 titled “ECRI Recession Watch: Weekly Update.” These charts are on a weekly basis through the February 28 release, indicating data through February 21, 2014. 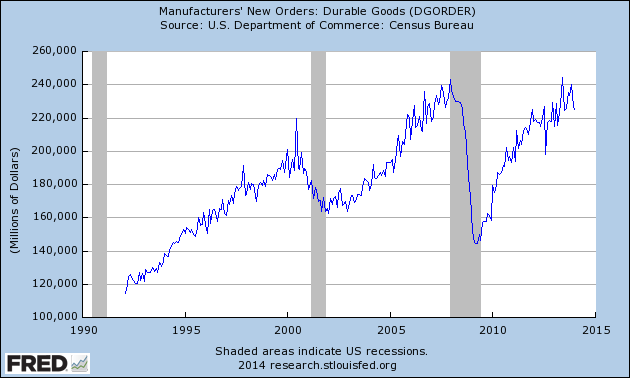 This entry was posted in Economic Forecasts and tagged ECRI on February 28, 2014 by Ted Kavadas. 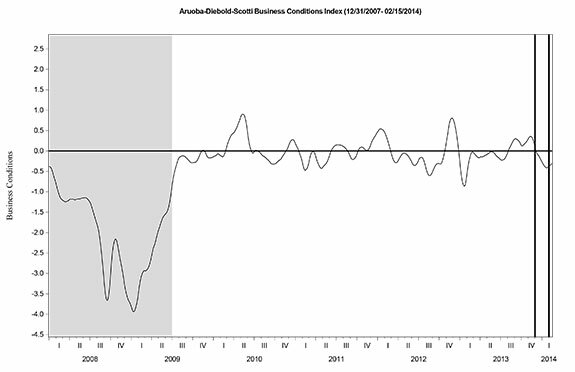 This entry was posted in Uncategorized and tagged Consumer Confidence on February 28, 2014 by Ted Kavadas. This entry was posted in Economic Forecasts and tagged Economic Forecasts, economic indicators, STLFSI on February 27, 2014 by Ted Kavadas. 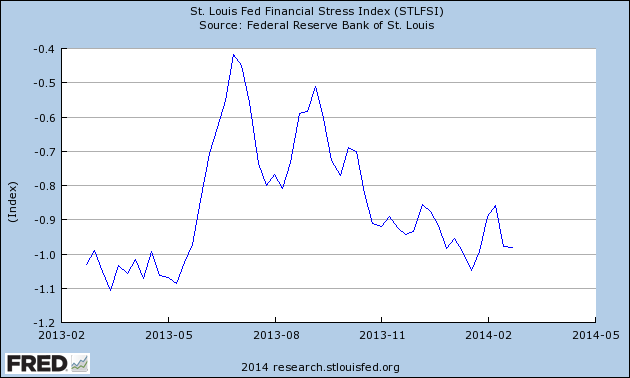 This entry was posted in Uncategorized and tagged economic indicators on February 27, 2014 by Ted Kavadas. Economic Expansion, Recession Or Depression? 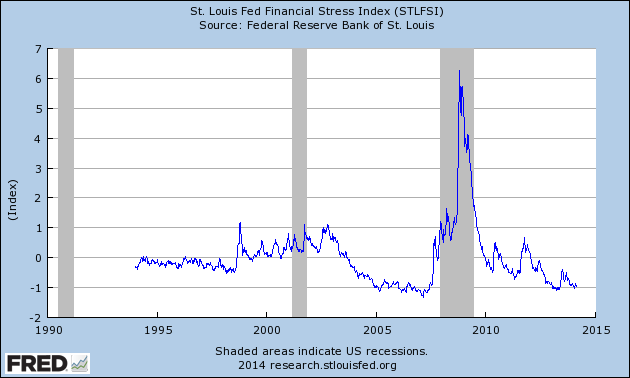 On April 29, 2011, I wrote a post titled “Recovery, Recession, Or Depression?” in which I highlighted the issue of whether the U.S. economy was then in an economic recovery, economic recession, or economic depression. Now, almost three years since that post, and nearly five years since the end of June 2009 NBER Business Cycle Dating Committee’s (BCDC) “end of the recession,” the issue of what part of the business cycle the U.S. economy is in still seems debatable. While many will find the defining and classification of the business cycle to be semantics – figuring that economic activity “is what it is” – I believe that for many reasons the correct determination of where we are in the business cycle has important implications in understanding future economic activity. Of course, many economic indicators – perhaps most notably real GDP growth – continues to show “economic expansion.” As well, many other economic indicators, including those that (purportedly) most influence the NBER BCDC’s official classification of the business cycle, support the current “economic expansion” classification. Some indicators, including aggregate corporate profits are at all-time record highs and have performed strongly. And, of course, various U.S. and international stock markets are very close to record highs, after having performed strongly in 2013. Also supporting these various subdued consumer confidence readings are various surveys that continually indicate that respondents don’t seem to believe that the U.S. economy is in an expansion. One of these was the Marist Poll results of February 5, in which 61% of respondents believe that the U.S. economy is in a recession. 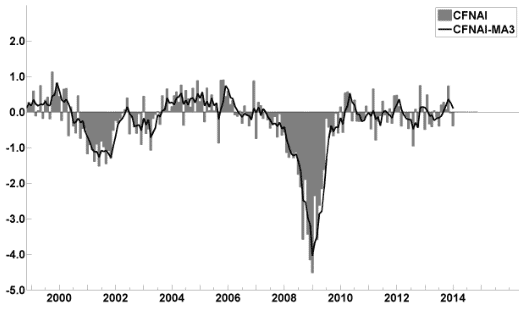 Interestingly, despite the various economic indicators, surveys, and other factors that support a “recession” classification, very few prominent economic forecasters or economic models indicate such a “recession” classification. In fact, not only do these various economic forecasters and models affirm that the U.S. economy is not in a recession, but they also indicate that the probability of the U.S. economy entering a recession in the near-term is low, if not very much so. One notable exception is ECRI, which has repeatedly reaffirmed that the U.S. continues to be in a recession. As to whether the U.S. economy is in an economic depression is a complex topic. One of the issues, as I explain in the “Defining An Economic Depression” post, is that the NBER BCDC does not define an economic depression, nor does it use the term as a classification. While I am not aware of any prominent parties who believe that the U.S. is currently experiencing an economic depression, if one believes that the U.S. is not experiencing an economic expansion, the question as to whether we are experiencing an economic depression should (at least) be contemplated. As I mentioned in the “Defining An Economic Depression” post mentioned above, perhaps the main “unofficial” guidepost of an economic depression is a 10% decline in economic output. While the U.S. certainly has not experienced such a decline, if one takes a longer-term view of the economic history, and includes a broad list of economic indicators, factors, and surveys, one can make an argument that there is a protracted period of economic weakness in various indicators, as well as many other highly disturbing signs that should reside outside of even a “recession” classification. I discuss my continuing view on how I interpret the ongoing economic situation in the “A Special Note On Our Economic Situation” page. Of course, the paramount question is “what happens next?” Will the U.S. economy continue to avoid (as almost universally forecast) widespread economic weakness – or will widespread economic weakness occur? I continue to believe, based upon various analyses, that various underlying “unresolved issues” – including many exceedingly large asset bubbles – and trends both in the economy and financial system continue to be vastly problematical. On an “all things considered” basis, the underlying dynamics bode very poorly for the future economic situation. This entry was posted in Depression and tagged Depression on February 24, 2014 by Ted Kavadas. With regard to our current economic situation, my thoughts can best be described/summarized by the posts found under the 33 “Building Financial Danger” posts. This entry was posted in Uncategorized and tagged current economic situation on February 24, 2014 by Ted Kavadas. As of February 21, 2014 (incorporating data through February 14, 2014) the WLI was at 133.2 and the WLI, Gr. was at 2.5%. As per the February 20, 2014 press release, the LEI was at 99.5 and the CEI was at 108.1 in January. “The increase in the Leading Economic Index reflects an economy that is expanding moderately, although the pace is somewhat held back by persistent and severe inclement weather in most parts of the country,” said Economist Ken Goldstein. “If the economy is going to move on to a faster track in 2014 compared to last year, consumer demand and especially investment will need to pick up significantly from their current trends. This entry was posted in Economic Forecasts and tagged ADS Index, Aruoba-Diebold-Scotti Business Conditions Index, Chicago Fed National Activity Index, Conference Board CEI, Conference Board LEI, economic forecasting, economic indicators, ECRI on February 24, 2014 by Ted Kavadas. Below are three long-term charts, from Doug Short’s blog post of February 21, 2014 titled “ECRI Recession Watch: Weekly Update.” These charts are on a weekly basis through the February 21 release, indicating data through February 14, 2014. 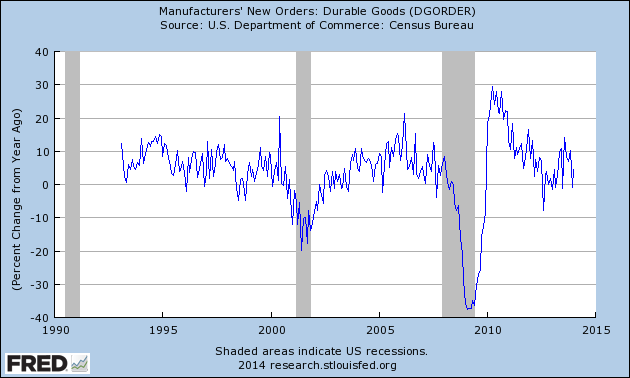 This entry was posted in Economic Forecasts and tagged ECRI on February 21, 2014 by Ted Kavadas. This entry was posted in Uncategorized and tagged Markets During Intervention on February 21, 2014 by Ted Kavadas. This entry was posted in Economic Forecasts and tagged Economic Forecasts, economic indicators, STLFSI on February 20, 2014 by Ted Kavadas.